Acoustic Open Mic Night at Electric Beanz – Thursday August 12 at 7:30pm! Electric Beanz Coffee Bar is holding an Acoustic Open Mic Night on Thursday August 12th at 7:30pm. Musician sign up starts at 7pm. Each performer can sign up to perform a maximum of 3 songs per time slot. Once everyone has had a chance to share their talent, those wishing to sign up for a 2nd round are more than welcome to perform again. 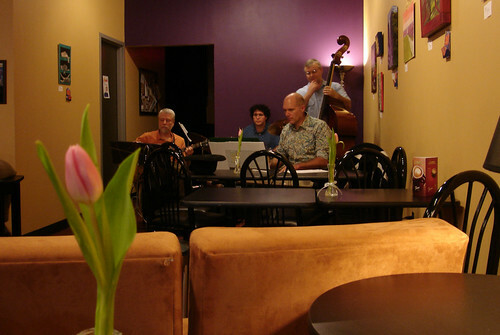 Electric Beanze has a nice relaxing atmosphere and is the perfect location for budding and experienced musicians alike to hone their craft. They also serve some of the best organic coffee around and as an added bonus offer some great local beers from Aviator Brewing Co. in Fuquay and wines from the Triangle’s own Chatham Hill Winery. For more information about the Open Mic Night check out their Facebook Event Page.